They have released Free Goods of the Week on 31 Aug 2015. They’re available until midnight of 6 September 2015. Grab this weeks freebies from across Creative Market. Introducing murmers typeface is a serif font. It is inspired by old films about a murder or crime. This is a great for vintage design, t-shirt, logo, labels, posters, badges and etc. This weeks free serif font on creative market. Need a radical texture package for your posters or website work? 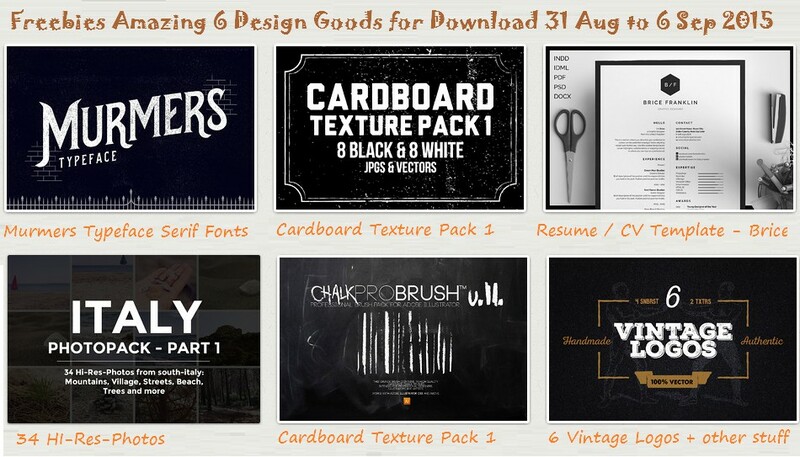 This package has including 8 black 2200 px x 2200 px 600 DPI jpgs + 8 vector EPS formats and 8 white 2200 px x 2200 px 600 DPI JPEGs + 8 vector EPS formats cardboard textures. This weeks free Cardboard Texture on creative market. Introducing 'Brice', a simple, vertical design which includes a single page resume/cv and cover letter. International A4 & US Letter sizes included Includes 90 Social Icons for use within your layout (InDesign/Illustrator/EPS/PNG). All artwork and text is fully customisable; Easily edit the typography, wording, colors and layout. Each template uses a strong baseline/document grid which will allow you to edit or add to the layout very easily. This weeks free Professional Resume Template on creative market. You will get 34 Photos (3000 x 2000 px / 300 dpi) as an zip-file (161 MB). The Photopack includes Photos from south of Italy, for example Mountains, Trees, Beach and many more. This weeks free Hi-Res Photos on creative market. This grunge brush contains 16 high quality HANDMADE chalk brushes intended for professional designers, illustrators and artists. Works with Adobe Illustrator CS3 and above. This weeks free Chalk Brush on creative market. This pack includes: 6 pre designed very vintage logo templates, 5 Hand drawn vintage illustrations, 4 hand drawn sunburst elements, and 2 grainy hand made texture. The files can be opened and edited with Illustrator CS or newer. This weeks free Vintage Logos and graphics objects on creative market.